A rather simple enquiry, sent out in all directions, spiralled into a saga. If you have any interest at all, grab a cuppa and put your feet up to read. Sir John Johnson was an outstanding Loyalist of the American Revolution, forming and leading the King's Royal Regiment of New York during the entire conflict. After the War he acquired extensive lands in Canada, the seigniories of Argenteuil and Monnoir among them. The home he built before 1800 at Williamstown, Glengarry--where he settled so many of his fellow Loyalists--is a National Historic Site of Canada. Sir John had a number of other homes as time went on. Having purchased the Seigniory of Argenteuil in 1808, he had built a manor house there too—not long after it was destroyed by fire. He donated the land for the construction of St. Andrews Presbyterian Church in St. Andrews East (now officially Saint-André d’Argenteuil), Quebec. 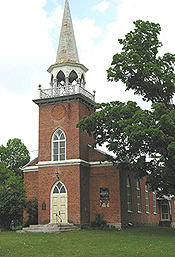 The Scottish church was completed in 1821 under the ministry of Mr. Archibald Henderson. Wow, was I impressed. A bell with a Loyalist history! Right there in the church of my non-UE ancestors. At last, a family connection--however faint and remote--to Loyalists. I'm on it. My burning question was: Does St. Andrews Presbyterian Church still have and display this fabulous bell? A little more research showed that master founder Pieter Seest was the foreman of Amsterdam’s bell and cannon factory, eventually becoming a director of the firm in 1770. The date on St. Andrew’s bell makes it a year older (this bell is becoming personal for me) than the bell housed in the famed U.S.S. Constitution Museum in Boston. The American ship won an 1812 sea battle with the British H.M.S. Guerriere and took the bell as a war trophy; the victory earned it the nickname of Old Ironsides. There's even more here in a news story. Apparently other bell and cannon artifacts have been occasionally located with Pieter Seest’s foundry signature. With only superficial research, I wondered if many of them would be older than 1764. I want MY bell to be the oldest. 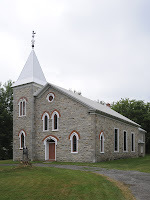 Then I discovered that in 1822 Sir John had donated a bell to St. Stephen’s Anglican Church in Chambly, Quebec. The church is not far from his final home at Mont St-Grégoire. The St. Stephen's bell was "imported from England by Sir John Johnson" and bears an inscription reading "Isaac Tod 1812." Sounds like the creator's name and date, n'est-ce pas? No competition here; MY bell is definitely older. Feedback for my enquiry began to arrive. Genealogical kindnesses are legendary and no exception in this case. The information Ray provided was highly interesting and educational. My assumption--n'est-ce pas--about "Isaac Tod 1812" was just that, an assumption based on the one source. For all I know, the church itself is under this impression too; time restraints meant I was merely scratching the surface. But my simple query threatened to take on an active life of its own. Ray has seen the St. Stephen's bell, and it has no type of foundry mark on it. Turns out the Northwest Fur Company had a ship called Isaac Todd constructed in 1811. Todd was a retired fur trader with the Company. 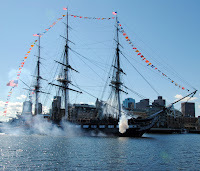 The ship was outfitted in England to take part in the War of 1812. After the War it continued in the fur trade until September 1821 when it foundered in Baie des Chaleurs. Salvaged rigging, fittings, and other materials from the ship were at public auction a month later. The bell could well have been among them, so it's plausible that Sir John could have purchased it then with St. Stephen's in mind. Whether the bell was made at the time the ship was constructed, or earlier, MY bell is still winning. It gets better. Ray is a brilliant bell source. Apparently Sir John, or his wife, depending on sources, made the gift of a bell in 1801 or 1802 to the (then new) chapel Sainte-Marie-de-Monnoir--Monnoir being one of the Johnson-owned seigniories. Ray has no more details other than it was apparently manufactured in England. You see we are reaching a stage of secondary information and hypothetical probables regarding bell manufacture. But that's three Johnson-donated bells so far. It gets even better. Or worse. Gail responded and introduced me to Isabel who grew up in the St. Andrews area. Isabel reminded me of one book I had not reviewed recently. Reviewed, as in: writing from old notes and current research my family history that instigated this entire craziness--a history of Christ Church at St. Andrews. The author says Sir John gave his bell to the Anglican church. How crushed am I?! As well, he gave land for that church's site too. Who exactly has the Mohawk Valley bell? ... very worrisome. Both churches at St. Andrews are not in regular use now. But on reading E.G. May's text, some clarification: "Cast somewhere in Europe in 1759, and brought out to this country in the early days of its settlement, the old wide mouthed bell was presented to the Church by the Seignior." From that, I will concede that the Christ Church bell is older, but that it came directly from Europe to "this country," meaning Quebec, after the time of the American Revolution. Hopefully my tenuous Loyalist connection is intact. Isabel's on-site investigation now assures me that MY bell is still safely lodged in the Presbyterian church. Who knew the Johnson family was in the habit of donating bells? Ecumenically, at that. I do love tangents. Loyalist Trails, York Courant, Ray, Gail, and Isabel, thank you all!! Earle Thomas, "Johnson, Sir John," Dictionary of Canadian Biography Online (http://www.biographi.ca/009004-119.01-e.php?&id_nbr=2937 : accessed 1 October 2012). Lucille Campey in Les Ecossais: The Pioneer Scots of Lower Canada, 1763-1855 (Toronto: Natural Heritage Books, 2006, p. 55) says Sir John purchased Argenteuil in 1814. Alain Chebroux, "The Seigniory and County of Argenteuil [in New France]," Comte d'Argenteuil (www.comte-argenteuil.com : accessed 1 October 2012 and numerous times previously) has original documentation that says the Murray-Johnson transaction took place 26 December 1808. W. Harold Reid, The Presbyterian Church, St. Andrews and Lachute, Quebec, 1818-1932 (Hamilton, ON: Eagle Press, 1979), 10-11. USS Constitution Museum (www.ussconstitutionmuseum.org/ : accessed 1 October 2012); the path is Collections, Art and Artifacts, Spoils of War, Ship's Bell from HMS Guerriere. 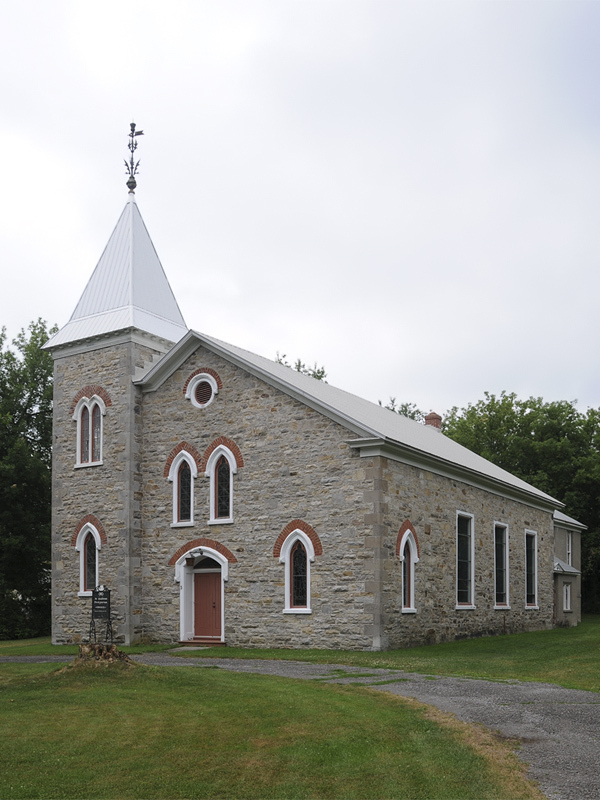 St. Stephen's Anglican Church of Chambly (http://st-stephens-church-chambly.org/ : accessed 15 September 2012). I am not identifying full names of my informants for their own privacy .. unless they wish to comment. E.G. May, A Hundred Years of Christ Church, St. Andrews, P.Q: An Historical Sketch of the Pioneer Church of the Ottawa Valley (St. Johns, QC: E.R. Smith, 1919), 67. The text of the book is available on Internet Archive (www.archive.org). Thanks for this interesting post! I was trying to find out more about St Andrew's Presbyterian Church, where a couple that I am researching married in 1841, and you have helped me considerably. Do you know whether the current stone/brick building is the one that was built in 1821? Jean, I believe the current stone church is the original one but I have not been able to confirm that. Perhaps the archives of the Presbyterian Church in Canada (http://presbyterianarchives.ca/) can provide an answer, or a resource person to contact.